GERMANY RESPONDS TO ALBANIAN “NAZI” STATUES – Alternate Comms. 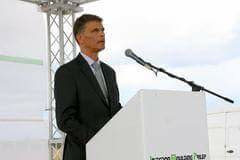 Team Uzunov blog exclusive – Deputy German Ambassador to Macedonia Mr Marco Acquaticci (pictured below) responds to concerns over Albanian Nazi collaborator statues that have been unveiled in Macedonia. Ambassador Acquaticcci has given Team Uzunov the following statement. “Let me assure you that Germany intensively faces up to its past and particularly the history of National Socialism [Nazism]. “Germany therefore supports several initiatives and promotes a wide-ranging dialogue related to these issues, also in the countries of the Western Balkans. 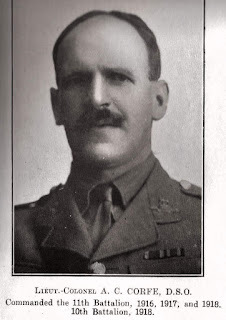 Despite repeated requests from Team Uzunov blog, and In stark contrast to the Germany Embassy, the US Ambassador to Macedonia Mr Jess Baily has declined to comment on the controversial statues of Xhem Hasa (also known under the nom de guerre of Gostivari, Xhemal, Xhemail or Dzemo) and Aqif Krosi Recani, both commanders of an Albanian quisling militia, the Balli Kombetar, funded by Fascist Italy and Nazi Germany during Word War II and active in western Macedonia. BEJTA – the man behind the two statues ! 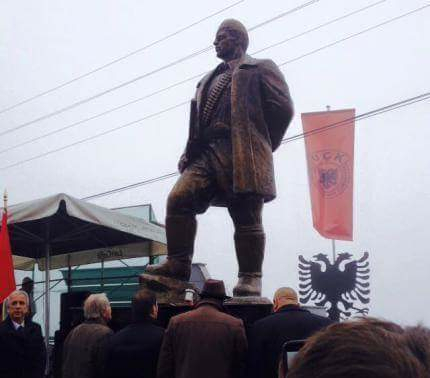 Nevzat Bejta, expresses “pride” in building two Albanian Nazi collaborator statues in western Macedonia. Odd way to express “human rights activity.” Normally you would be invoking Nelson Mandela or the Dalai Lama ! Në fjalimin e tij, kryetari i Komunës së Gostivarit, Nevzat Bejta shprehu lumturinë që në mandatin e tij të parë në fshatin Simnicë u ngrit shtatorja e heroit kombëtar Xhemë Hasë (Simnica), dhe në mandatin e dytë të tij si kryetar komune, shpaloset shtatorja e bashkëveprimtarit të Xhemës, ballistin të shquar kombëtar, kombëtar Aqif Krosi (Reçani). A 2009 US Diplomatic cable privately denounced Bejta. 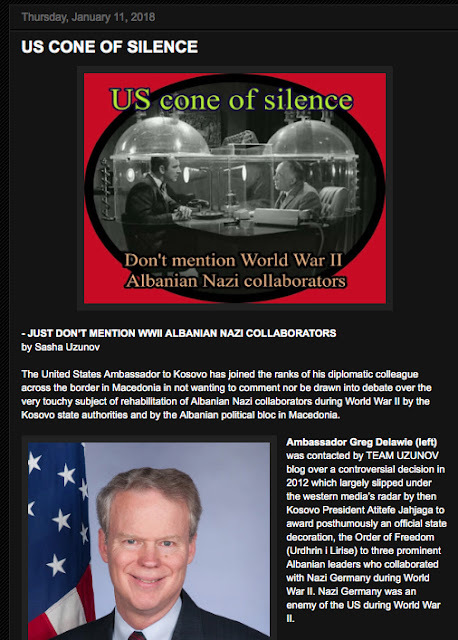 But publicly the US refuses to denounce his building of World War II Albanian Nazi collaborator statues ! 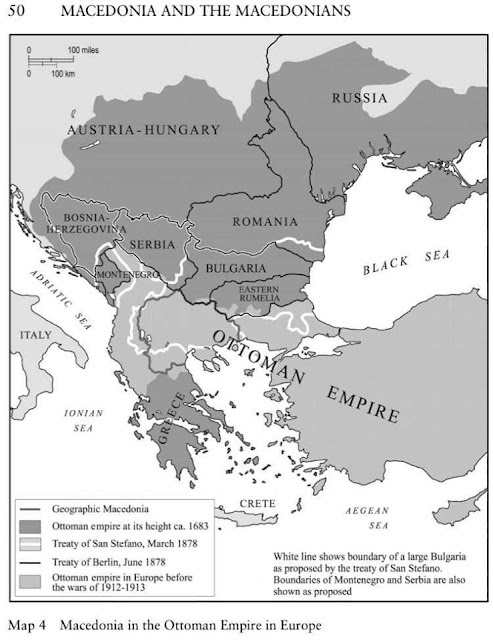 Macedonia came under the rule of the harsh Ottoman Turkish Empire (1400s to 1912) and Albanians were used as shock troops -or irregulars known as Bashi-bouzuks- of the Empire in keeping Macedonians in line. 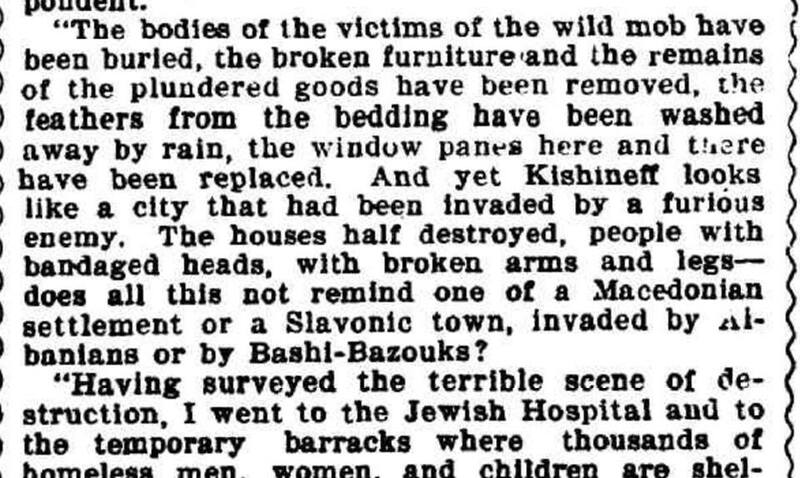 1903 – Reporter likens massacre of Jews (pogrom) in Tsarist Russia to Albanian atrocities against Macedonians. EASTERN EUROPE. CONTINUED PERSECUTION OF MACEDONIANS. Advices from Sofia intimate that the Bulgarian Government is placing 3,000 additional troops on the Turkish frontier. 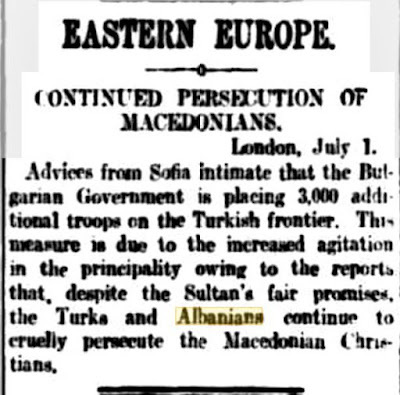 This measure is due to the increased agitation in the principality owing to the reports that, despite the Sultan’s fair promises, the Turks and Albanians continue to cruelly persecute the Macedonian Christians. 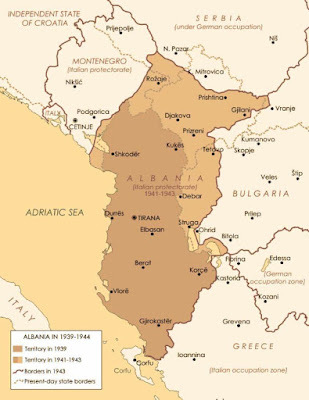 Current Albanian nationalist ideology – has been shaped by the World War II Balli Kombetar – in pursuit of an ethnically pure Greater Albania which would include Albania, Kosovo, a large slice of western Macedonia and a piece of north-western Greece, the Epirus. 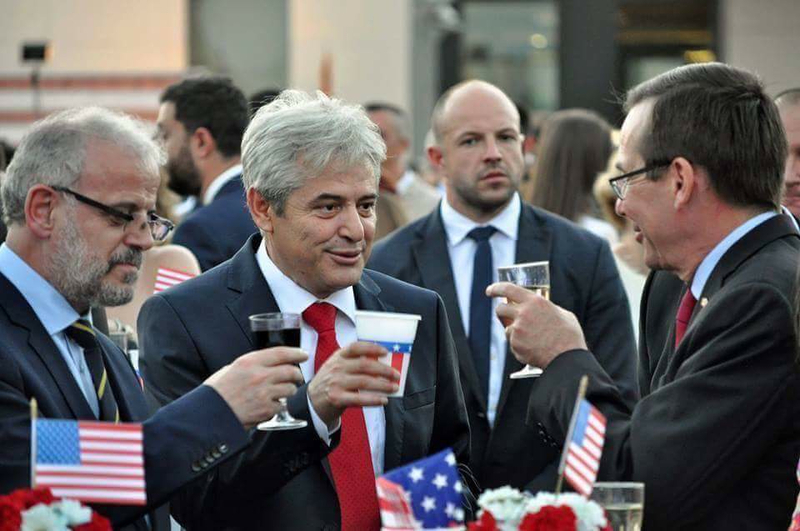 Macedonians, according to this extremist ideology, are regarded as being part of an “evil Slav” conspiracy together with Serbs in wanting to persecute Albanians. Many Macedonians regard the epithet “Slav” as being a racist insult used against them to deny their native identity. 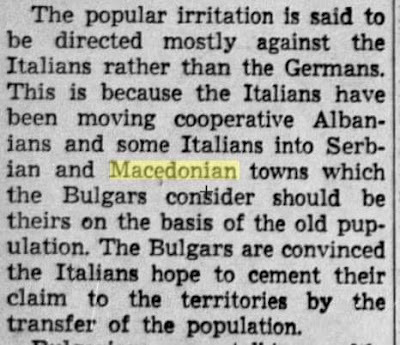 According to a prominent mainstream academic, Dr Florin Curta of Florida University, there was no “Slav migration” to the Balkans in the 7th century, meaning the modern day Macedonians are people who are largely indigenous to Macedonia. 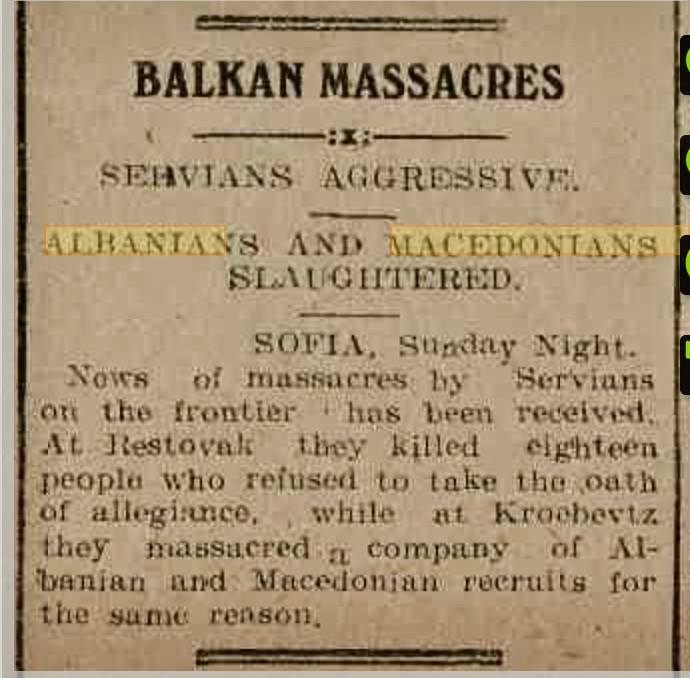 Albanian nationalist ideology deliberately ignores the fact that Macedonians were themselves the victims of brutal Serb colonialism beginning in 1912-13 with the partition of Macedonia amongst Serbia, Greece and Bulgaria. Greece and Bulgaria also imposed their own brutal forms of colonialism and assimilation. In 1944 a Macedonian republic, within the framework of federal Yugoslavia was proclaimed. 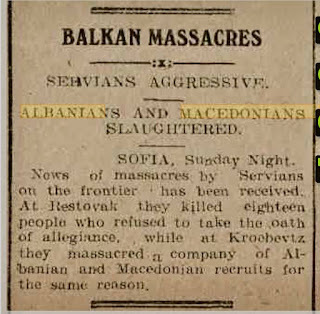 Service in the Royal / Colonial Serbian Army – Albanian and Macedonian recruits who refused to take the oath of allegiance to the Serbian Crown killed. Citation: British Foreign Office document – FO371/29785, Campbell (Belgrade) to Halifax, 6 January 1941. In April 1941, with the German invasion of then Kingdom of Yugoslavia, that part of Macedonia under Serbian colonial rule was further partitioned amongst Nazi allies Bulgaria and Fascist Italy. Within the framework of an Italian “protectorate” a Greater Albania was proclaimed and included a chunk of western Macedonia. 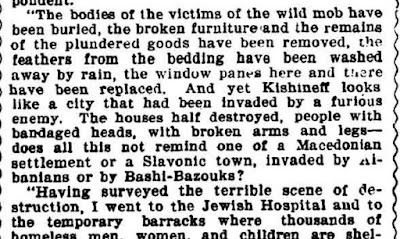 The Bulgarian occupation forces rounded up the Jews from Macedonia and handed them over to Nazi Germany for the Final Solution, the Holocaust. 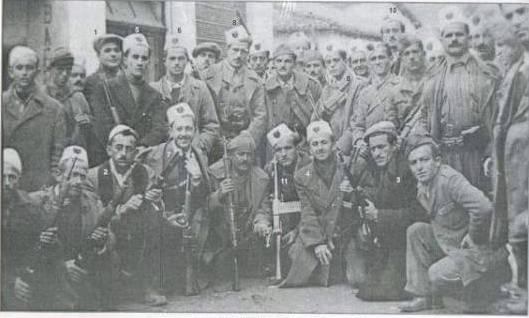 The Macedonian partisans (left) fought the Italians, Germans, Bulgarians, the Albanian Balli Kombetar and even Serbian Chetniks, royalists who wanted the return Serbian colonial rule. 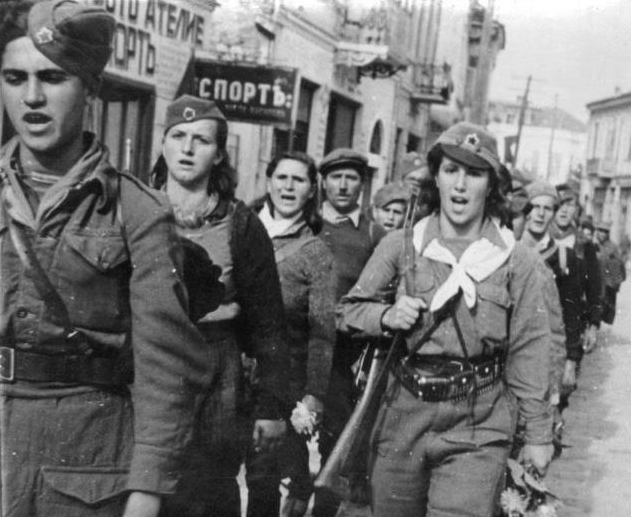 A number of ethnic Albanian partisan battalions were also included in the Macedonian partisan army known as the NOVM – the National Liberation Army of Macedonia. The Balli Kombetar was involved in ethnic cleansing operations against Macedonians in western Macedonia and also killed anti fascist Albanians. Albanian & Italian colonialists in western Macedonia. 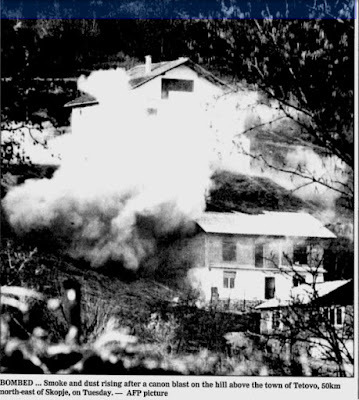 In 1985 Macedonian State TV (then known as Radio Televizija Skopje – when Macedonia was a republic in Federal Yugoslavia) made a film about Xhem Hasa Gostivari, drawing upon Macedonian and Yugoslav archives at the time, which largely tally with British military accounts quoted above. The selective nature of Macedonia’s ‘civic’ organisations, NGOs – read US government backed – in their behaviour over corruption, rule of law, democracy, Euro-Atlantic values, can be best summed up by the virulent attack on so called Macedonian “nationalism” and various statues and monuments but the incredible silence and inaction over Albanian fascist monuments that have sprung up in the country. There is kind of moral perversity in attacking a “kitsch” statue of someone purported to be Alexander the Great on a war steed designed to bring in Asian tourists and in the same breadth remaining silent over statues to men who collaborated with fascist Italy and Nazi Germany during World War II (1939-45). The 1940s weren’t that long ago; whilst Alexander the Great is now dust and goodness knows where his remains are after 2,000 years. All of this is a smokescreen to appease Greek nationalist demands when even the “Hellenic pedigree” of Alexander is in question. Be that as it may, it’s nothing more than a red herring. 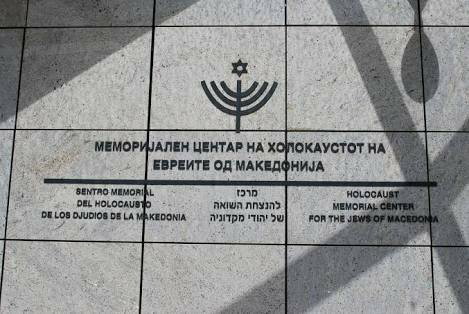 2011 – A museum dedicated to the memory of the Jews of Macedonia who perished in the Shoah has been inaugurated in the former Yugoslav republic, in the presence of the country’s president and representatives of international Jewish organizations, including the World Jewish Congress (WJC). 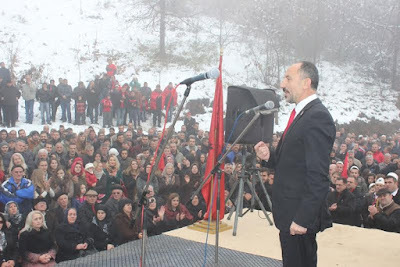 You have to seriously ask why has there been silence from successive Macedonian governments, as well as various US Ambassadors, EU mandarins over the rise of extremist Albanian nationalist ideology in Macedonia which invokes the likes of Xhem Hasa and Aqif Krosi Recani and even builds statues to such figures? Both men were commanders of the notorious Balli Kombetar, a quisling militia set up by Fascist Italy and later taken over by Nazi Germany. 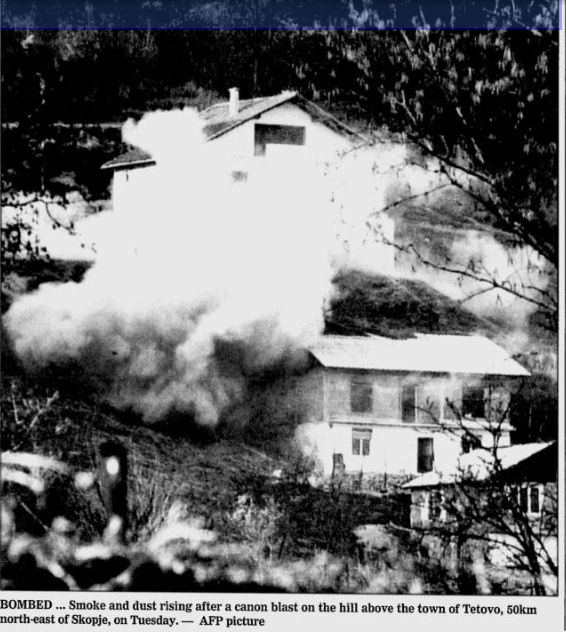 The Balli Kombetar’s objective was a Greater Albania, involving the ethnic cleansing of Macedonians in western Macedonia. Albanians who opposed the Balli Kombetar also fell victim. In 2006, a statue to Xhem Hasa was unveiled in his village of birth, Sminica, near the Macedonian town of Gostivar. 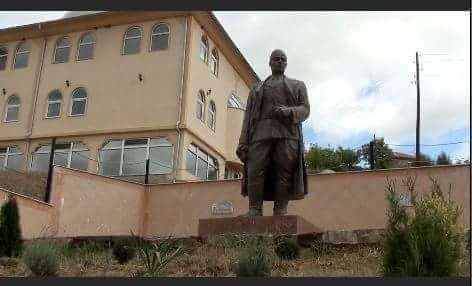 In 2015, with much fanfare and nationalist hysteria whipped up against the ‘evil Slavs” – the Macedonians, the ethnic Albanian Mayor of Gostivar Nevzat Bejat unveiled a statue of Aqif Krosi Recani in the village of Recan. Both times there was silence from various activists. Would the building of a statue to Hermann Goering or Heinrich Himmler in modern day Germany be tolerated? First and foremost, most Germans wouldn’t even consider the idea to begin with. The Albanian political bloc in Macedonia has largely supported these Balli Kombetar statues – which then raises question marks over whether its agenda for increased ‘Albanian rights’ in Macedonia is genuine or not? It’s unheard of genuine activists invoking fascists. Genuine activists would be citing Nelson Mandela or the Dalai Lama. Getting back to the question over silence – the Albanian Bloc in Macedonia is staunchly pro US and there is a reluctance to go against such allies, the Kosovo Liberation Army’s offshoot in Macedonia, the NLA, which started a war in 2001 in Macedonia. 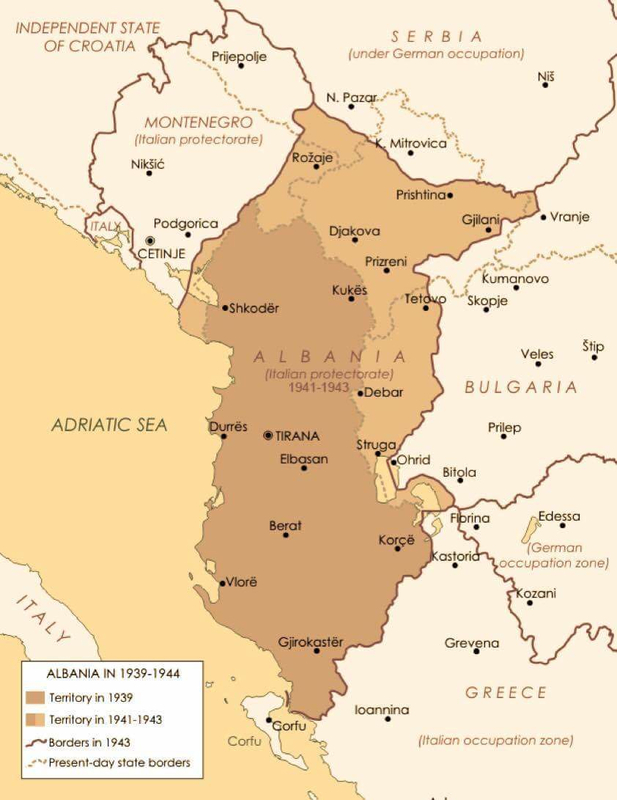 The objective then was to take territory for a Greater Albania much like the Balli Kombetar during World War II. 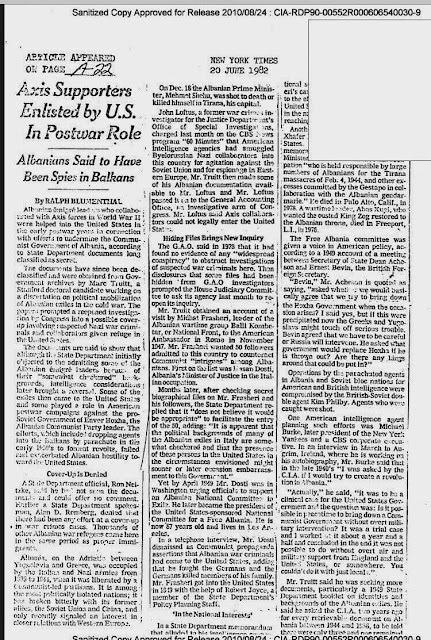 When the Macedonian security forces thwarted the plan, despite getting off on the back foot militarily, the Western media narrative, in support of the US, changed from grabbing territory to “human rights activism.” Albanian leaders such as Ali Ahmeti, Talat Xhaferi and so on went from being terrorists to “legitimate” political players – in the form of the political party DUI – in Macedonia, courtesy of a 2008 amnesty law introduced by the Macedonian government, no doubt strong armed by the US in the background. The interesting thing is a European Court of Human Rights ruling has laid down that war crimes cannot be “pardoned” or “amnestied” yet no Macedonian court is willing to launch an indictment of Ahmeti or any of the KLA leaders in Macedonia. “The tolerance for Nazi symbols illustrates the funny game the EU plays, where it is neither a loose federation nor a strong federation, but it can act like either the one or the other, depending on the day of the week, and the prevailing whim of unelected bureaucrats in Brussels. “To its credit, Germany goes out of its way to confront its own authoritarian past, almost to an extreme. 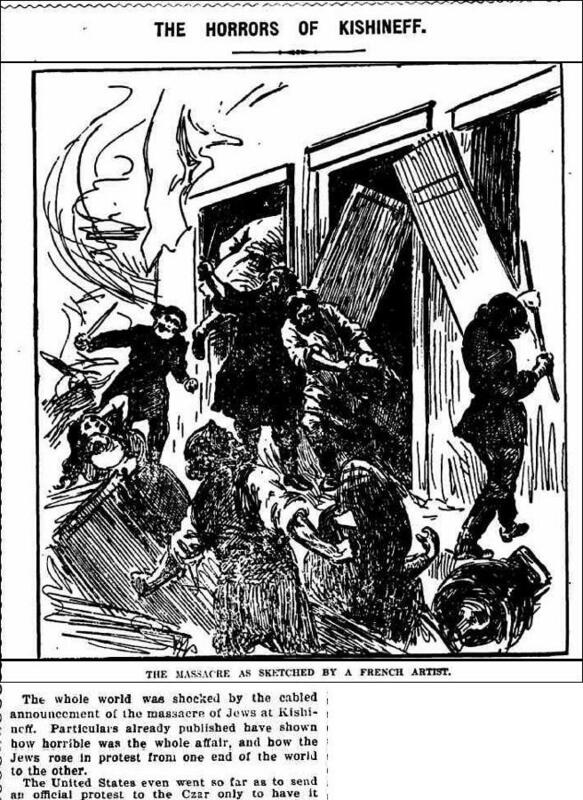 But Greece does nothing of the sort; the average Greek is hardly aware of what happened in island prisons like Makronisos [Greek island penal colony used to hold ethnic Macedonian prisoners]. Bulgaria actually leverages its EU membership to erase recognition of their Nazi past and rewrite history in a neighbouring country [Macedonia]. MONTENEGRIN (MINUS) – BULGARIAN (PLUS) SCENARIO ?